Utilizing exquisitely carved furnishings, skilled Amish artisans painstakingly handcraft each of our Bible Boxes from solid hardwood. So they’re perfect for storing your Bible. Each Brandenberry Bible Box is a one-of-a-kind accessories that’s sure to beautify your home. 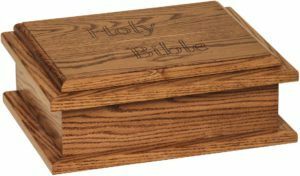 This is because each Bible Box features beautifully carved lettering and a variety of wood species and finish options. So choose a Bible Box for yourself. Or select one as a gift for someone special in your life. So browse our online catalog for full color pictures and a detailed list of measurements and custom options. Or, visit our store location in Shipshewana, Indiana. And discover first-hand why each Bible Box is so special.